With the end of the 2018 season in sight, NFL fans all over the country have turned their focus to the 2019 offseason and are wondering what steps their team needs to take to improve. For some franchises, numerous questions hover overhead. For a lucky few franchises, the questions are of little significance. Below are the biggest offseason questions for every NFL team. The Hall of Fame quarterback hasn’t seen a dip in his performance as he creeps into his 40’s. He’s in the midst of polishing off his fourth straight season with a 90-plus overall grade. Brady has said he wants to play until he’s 45, but this offseason will prove how much the Pats really believe of that. What happens at the Quarterback position? The Dolphins are rumored to want to move on from Ryan Tannehill and it’s a decision the grades back up. 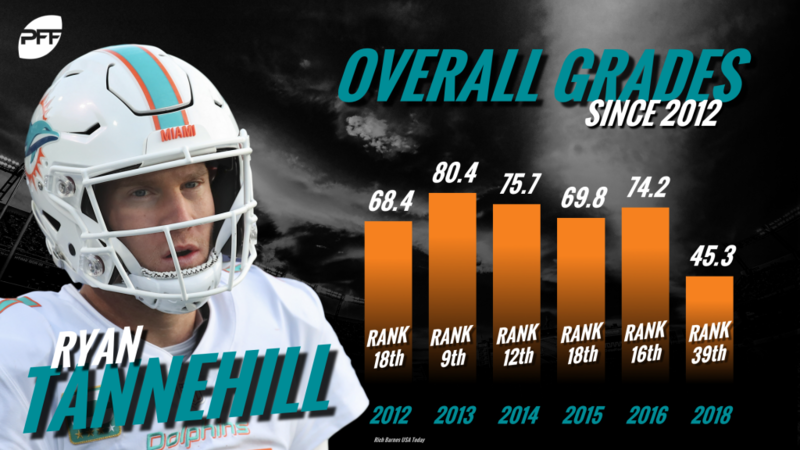 Despite one of the highest passer ratings of his career, Tannehill still earned a 45.3 overall grade last season. It’s year seven of the Tannehill era, and the improvement still hasn’t come. Where do they find help offensively? This is not the offseason to need help offensively. Our early look at the top offensive free agents is uninspiring, to say the least. The draft is also notedly deep defensively, but not so much on the offensive side of the ball. Josh Allen could use help at virtually every position around him, but there might not be enough talent to go around. Do we overspend to help Sam Darnold? This is almost the same situation the Bills are in except that the Jets have $12 million more in cap space to get it done. Quincy Enunwa was given a four-year extension almost because they had to spend money somewhere. The lack of talent on the free agent market is going to push the prices of otherwise mid-level talent skyward. 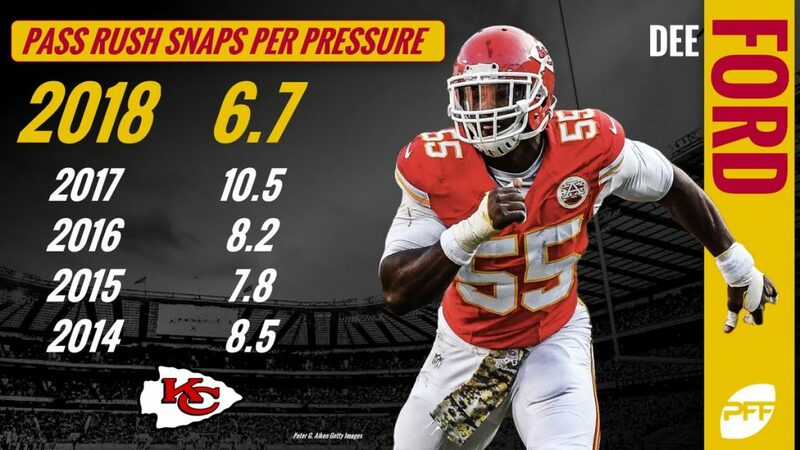 What to do with Dee Ford? Ford has racked up 29 more pressures this season than he has in any other season in his career. His career high pass-rushing grade in his first four seasons was 65.9. This year it’s 91.5. Obviously, you’d like to make sure it’s real before giving him a big deal. The Chiefs don’t have a ton of cap room though, and a franchise tag would sit $20 million against their cap in 2019 while a long-term deal could have a low initial cap hit and escalate. Is Dan Feeney going to improve? The Chargers drafted Forrest Lamp and Dan Feeney in the 2nd and 3rd rounds of the 2017 NFL draft, respectively, to revamp one of the worst offensive lines in the NFL. To date, Lamp has played a grand total of 17 snaps in the NFL while Feeney earned a 45.6 overall grade this past season. 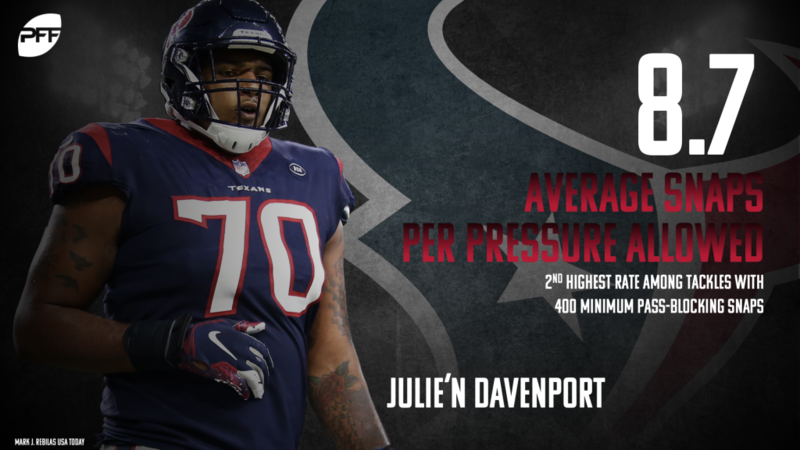 The offensive line still ranked in the bottom five in the league last year and it will likely stay there if it’s not addressed and neither youngster improves. The “No Fly Zone” ain’t walking through that door. The Broncos have bled talent on both sides of the ball since winning the Super Bowl in 2015. They were sellers at the deadline this past year and odds are players like Emmanuel Sanders, Ronald Leary, and Chris Harris Jr. aren’t going to be around for the Broncos’ next Super Bowl contender. Collecting as many draft picks as possible would be prudent with the current state of their roster. Is Derek Carr’s job safe? Carr is in the QB limbo where you could obviously do far worse at the position, but at the same time far better. He’s earned grades of 68.9 and 73.4 in 2017 and 2018, respectively. His contract is such that they could easily trade or cut him without severe cap repercussions and we’ve seen that no holdover is safe in the Jon Gruden era. At the most important position on the field, you can’t help but think Gruden will want his guy. Do they go all-in on a Lamar Jackson offense? 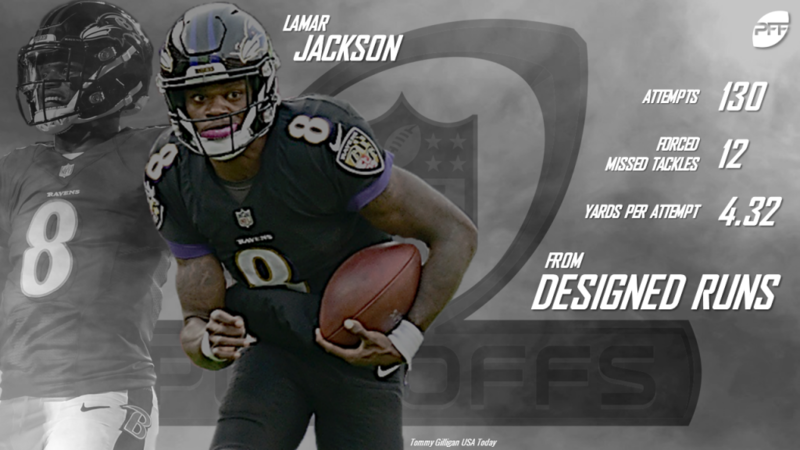 The Ravens went all-in on using Jackson’s legs as the focal point of the offense, and it led them all the way to the playoffs. No one has ever been willing to utilize a quarterback’s legs to that extent at the NFL level because of the injury risk associated, but there’s no denying how deadly it can be with someone like Jackson at the helm. Before Jackson, the Ravens were 27th in rushing yards (834) and 31st in yards per carry (3.6). In the last seven games with Jackson, they ran for 415 more yards than any other team and were third in yards per attempt (5.1). Can the Antonio Brown drama be reconciled? You don’t need our grades to tell you how deadly Antonio Brown is. Even in a supposed ‘down’ season, he still led the NFL in touchdown catches. The offense looked like a shell of itself without him in Week 17 against a hapless Bengals defense. They need Brown on the field to have a shot at the Super Bowl next season. Does Joe Thomas want to unretire? The answer to that question is obviously no, but they still need to figure out left tackle. Desmond Harrison was thrust into action as a UDFA and played better than expected, but still only earned a 57.1 overall grade through eight weeks. It worth debating whether they can trust him to protect the franchise’s most valuable asset. What to do with Andy Dalton? It’s been eight years of the Dalton era in Cincinnati, and we’ve seen improvement from the quarterback who had the highest-graded season of his career before his injury this past year. All that has still totaled up to a grand total of zero playoff wins. With the 11th overall pick, could the Bengals make a play for a quarterback in the first round? How do we protect Deshaun Watson? All of the young quarterbacks who’ve seen success in recent years have done so behind quality offensive lines, except Watson. With how much he can create on his own, it’s scary to think how good Watson could be when protected well. Where to spend all this cash? The Colts have the most cap space in the NFL and are coming off a 10-6 season where they exceeded expectations on both sides of the ball. They could add multiple blue chippers with how much space they have. Can Marcus Mariota win without being a part of the run game? There’s no debating that adding the quarterback to your run game makes it more effective. There’s also no debating that the Titans won’t be winning playoff games with Blaine Gabbert anytime soon. They have to find a way to keep Mariota healthy and the offense effective. How do we address quarterback position? Draft. Trade. Free agency. It must be done. There’s too much invested in this current roster, and the window is too tight not to. Is “run first” a viable strategy in 2019? The Cowboys continue to pound the ball at one of the highest rates in the NFL. It’s led to an offense that ranked 19th in points per drive this past year. Do we trust our young secondary? Ronald Darby is set to be a free agent. The Eagles have drafted three corners in the first four rounds in the last two drafts. Turning the keys over to them solely would be a boom or bust strategy. Will Alex Smith play again? A tib-fib fracture is about as gruesome an injury as you’ll see on a football field. There’s no guarantee Smith will ever be the same guy. Washington isn’t in position though to grab a top guy in the draft though, sitting at 15th overall. They passed on a quarterback at number two last year. Will they do the same at number six this year? What to do with one pick in the first three rounds? The Rams have dealt a lot of picks to assemble their current roster, and it’s made them a Super Bowl contender. They’re in a unique position where the best player available in the first round might not be their best strategy. Most impact available might be a better question. Earl Thomas earned a 91.3 grade before his injury this year but will be 30 and is at odds with management. Frank Clark earned a 77.1 grade this past year, so the tag could prove steeper than his market. Which position to address on defense first? Nose tackle. Edge Rusher. Cornerback. Linebacker. Safety. They need it all. Josh Rosen was surrounded by arguably the least amount of talent in the NFL last season. No player earned a grade above 76.0 offensively, and only Patrick Peterson did so defensively. While the Bears could obviously upgrade at several positions, there’s not one you’d classify as a huge need at the time. Mitchell Trubisky improving on his 63.6 overall grade would be the easiest way. Anthony Barr and Sheldon Richardson will both be free agents. Barr has been Jekyll and Hyde at times throughout his career, while Richardson hasn’t been able to replicate his early career dominance the past two seasons. Was it really just McCarthy? Matt LaFleur and Nathaniel Hackett have been given the keys to the Ferrari that once was Aaron Rodgers and the Packers offense. It hasn’t been that level since 2014 though. Do we blow it up? The Lions are currently in the basement of one of the league’s toughest divisions. The defense took a step backward after hiring a defensive head coach. Things aren’t looking great in Detroit. 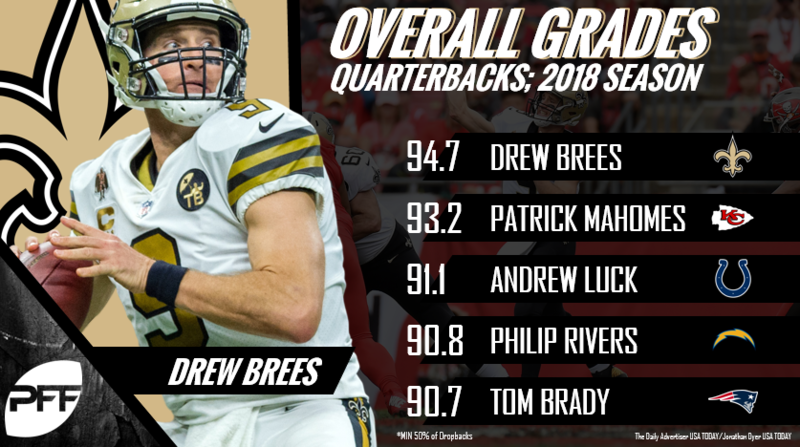 Drew Brees is 40 years old and still at the top of his game. His 94.2 overall grade is the highest we’ve ever given to him. If they win it all, he could easily ride off into the sunset. What happened to Robert Alford? The Falcons cornerback had developed into one of the league’s better starting cornerbacks in 2017 when he allowed an 80.7 passer rating in his coverage and broke up 17 passes. This year though, he allowed 849 yards and a passer rating of 138.9. They can’t have that in the starting lineup and expect to win. How do we keep Cam Newton healthy? Yet another season in Carolina goes down the drain after a Newton shoulder injury. His running was an integral part of the Panthers’ renewed offensive success before his injury, but a balance needs to be struck. Not even considering the off-field concerns, Jameis Winston has serious on-field concerns. He’s been nearly the exact same player since his freshman year at Florida State. In fact, his 70.2 overall grade this season was the same grade he earned as a rookie.